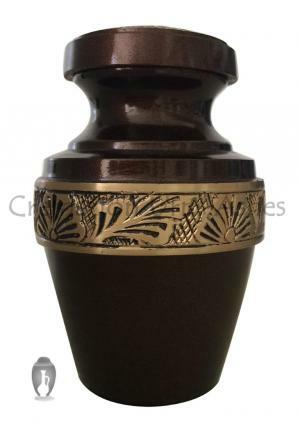 Hand cast from high quality brass, and finished in a bronze-effect brown brass with polished brass decoration, the Grecian Brown Keepsake Urn is a beautiful personal memorial. 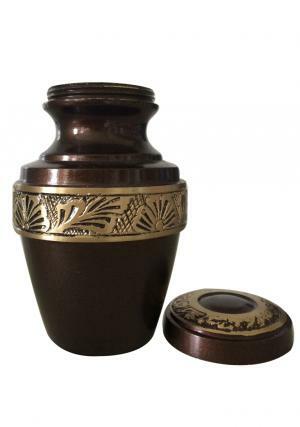 A band of polished brass, engraved with a hand crafted design, traverses the widest part of the urn’s center. The design features stylised floral and leafy arrangements. 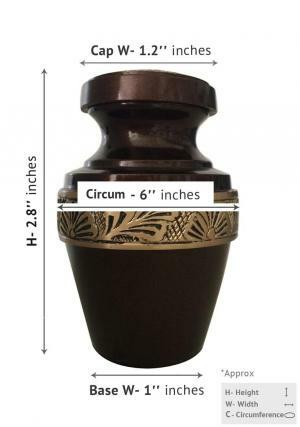 The Grecain Brown Keepsake Urn is just 2.8” high. This makes it ideal for all personal memorial situations. All of our keepsake urns are presented in velvet lined boxes, finished with a gold-coloured clasp. We post our urns free of charge to all mainland UK addresses. The Grecain Brown Keepsake Urn may also be posted overseas – for current rates and delivery times, please contact us using the details noted above. You can order our keepsake urns over the phone, conveniently and in complete confidence. We are registered as compliant with all data protection legislation, and never hold any of your personal information. Alternatively, you can use one of our trusted online checkout partner – PayPal, to complete your purchase. The death of a loved one is never an easy time. 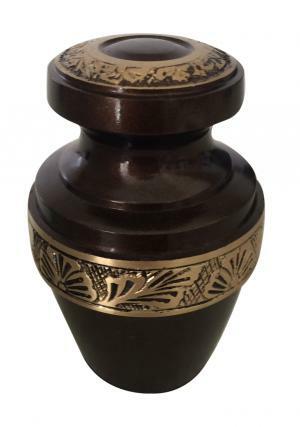 Our customer services team is here to make your urn choice as easy and as respectful as possible. If you would like information on anything, from design choice to size and suitability of placement, please contact us using the details provided above. We will be delighted to help you in whatever way we can.